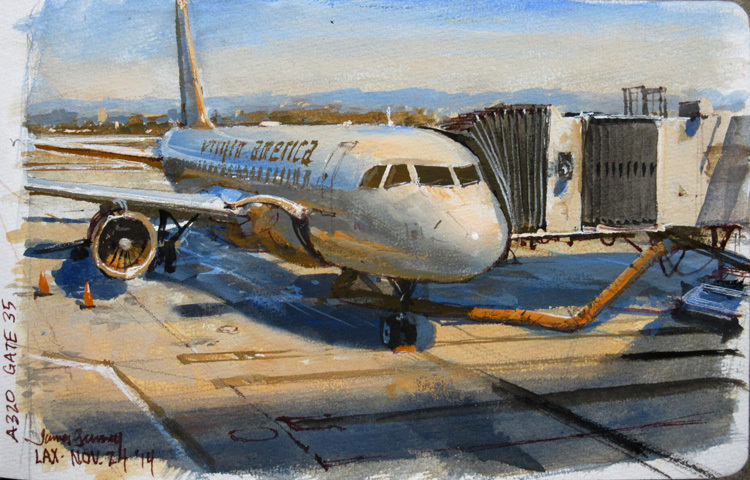 We arrived at LAX an hour and a half before my flight yesterday, so I painted this study of the aircraft at the gate. It's about 5x8 inches in a Pentalic watercolor journal . 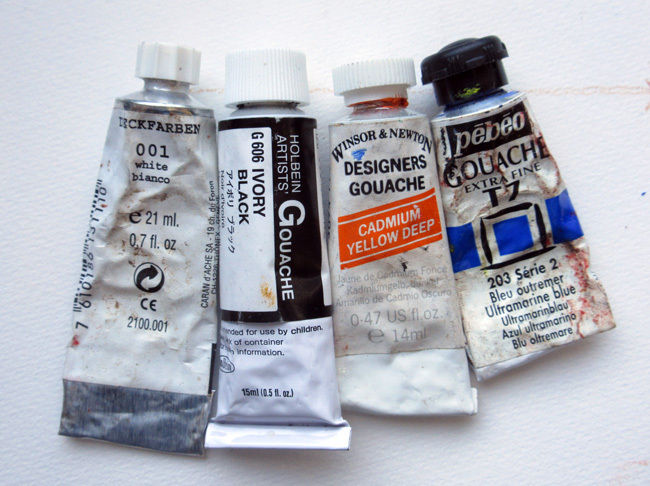 I used just four colors: white, black, cadmium yellow deep, and ultramarine. Those colors gave me a complementary gamut with warm and cool contrasts, and an interesting dull green. Halfway through the painting, I was disappointed to see the aircraft depart. My model was gone. But I got lucky. Another identical airplane arrived to take its place, so I could finish the study. To see a detailed step by step, with all the stages of this painting, check out my Facebook page. SWEEEEET! I like the different brand for each color. I love how the jetbridge hugs the airplane. How did you get paint box past TSA? I would be interested as well to hear about what are you are able to bring onto the aircraft in terms of water brushes & ink brushes, paints (tube, pan), inks, pochade, tripod, etc. I find it such an inspiration that you find subjects to paint everywhere. Thank you. I've seen paintings and illustrations using a complementary palette of blue and yellow/brown. I wonder if it could be done also with red/cyan and magenta/green (according with the yurmby wheel). It seems to me that the blue/yellow pair allows to achieve a more realistic effect while the others could look weird and unnatural. Is that right? Lys, good question. You could use any complementary pair, but the blue / cad Y deep dynamic has a different effect on us, is more basic. Annie, I was inspired by Robh Ruppel, a modern master of finding subjects everywhere. Dave, yes, I guess I inadvertently picked the gate with the regular shuttle flights. Glenn and Benedict, water based tubes, as long as they fit into your quart bag for the TSA are OK. Also, any water-filled pen or brush has never been a problem. Of course I emptied out my cup and filled it after being cleared. Jeff, I'm trying a bunch of them out. That's funny, the airplanes changing like models taking breaks. Thank you for always linking the important terms back to your old posts. I am so new to your blog and cannot read all of the articles. However, following the links to the old post is always surprising me. Thank you thank you! 歐莉娜, thanks for picking up on that. I'll be sure to do that in future posts. 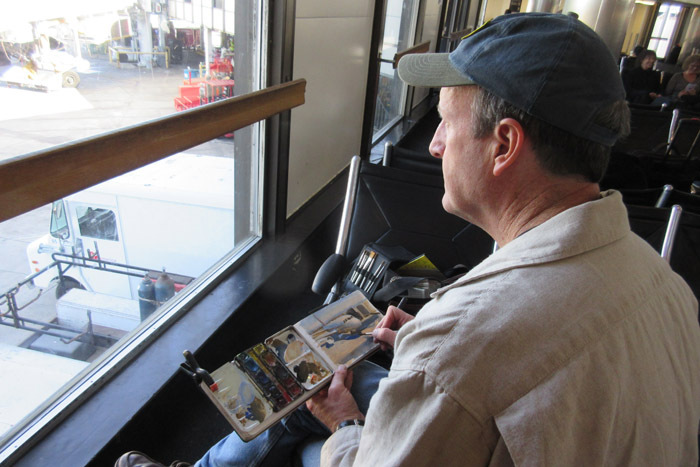 Mawyn, Yes, I'm learning to recognize the cycle of aircraft prep: Food, luggage loading, refueling -- and when they hook up the pushback tug, it's all over.